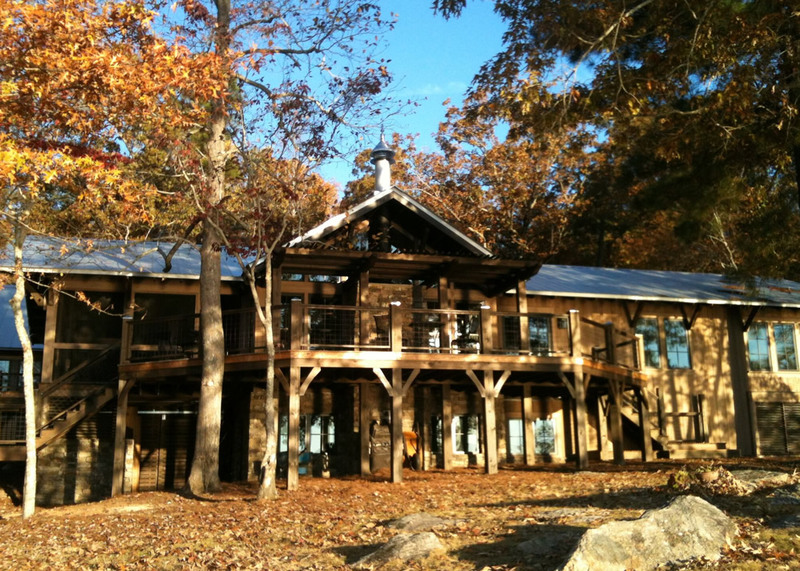 The Lake Martin Cabin was built as a family retreat on a lot that has sheltered 5 generations over 60 years. The cabin itself had to be flexible enough to accommodate 4 generations of the family simultaneously, yet feel cozy when a couple comes to stay by themselves. 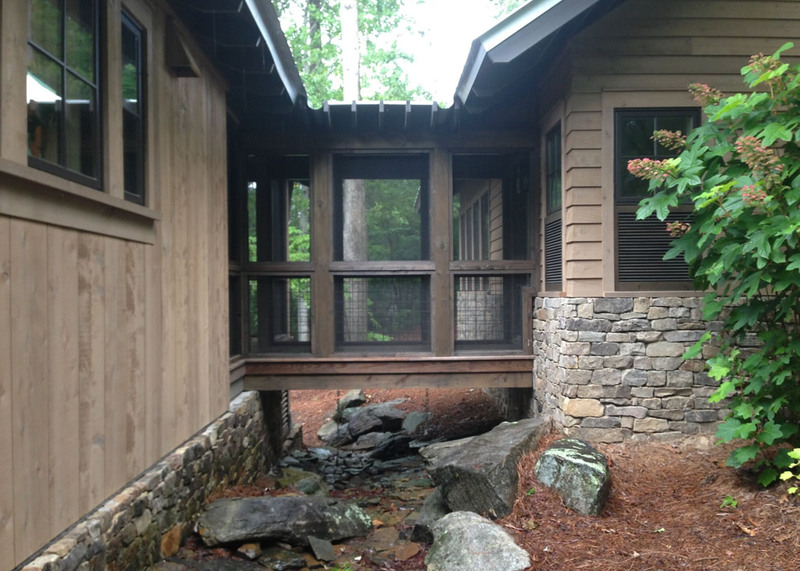 The homeowners wanted to create a resource efficient, healthy home that preserved the wooded ecology of their lake side property. They decided to use LEED for Homes certification as a way to quantify those goals, measure progress during design and construction, and hold all members of the design and construction team responsible for their achievement. 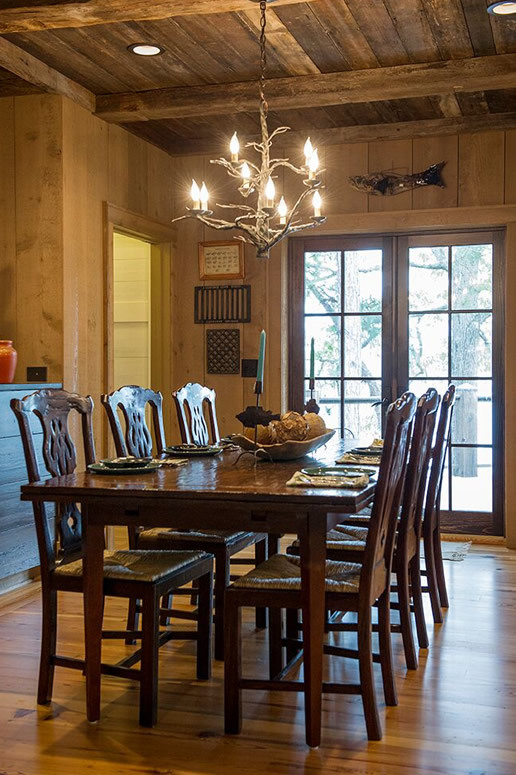 The lake cabin is built in Elmore County AL where there is no official permitting process, no structural inspections, plumbing inspections, etc. The homeowners also appreciated the oversight of the third party green rater, and the performance testing and visual inspections integrated into the LEED certification process. 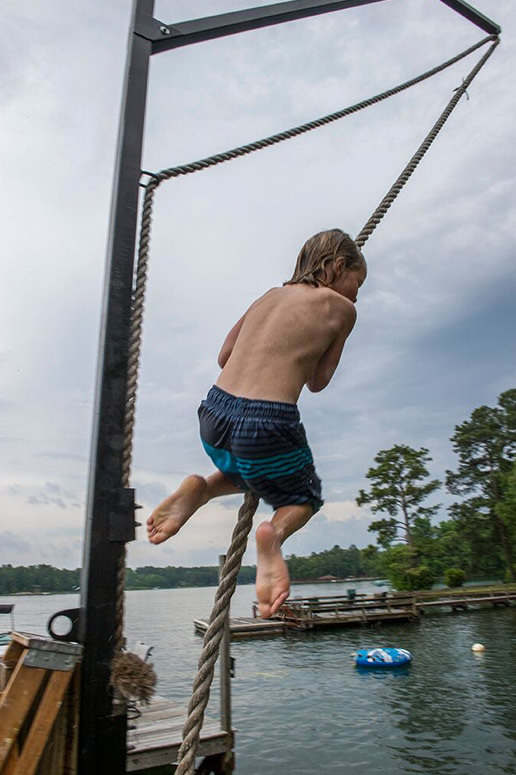 The cabin is the first LEED certified home on the over 44,000 acre lake, and the homeowners hope that it serves as a positive example of sustainable development in the region. 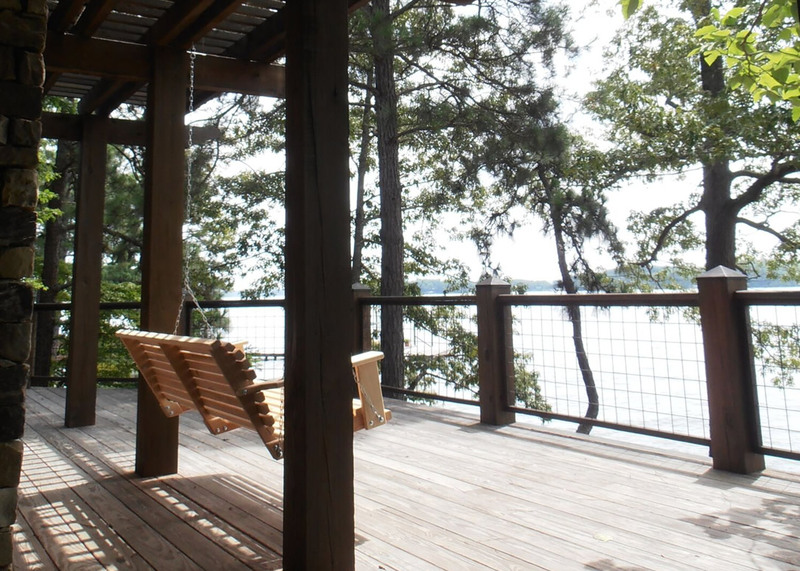 Each year since 2011, Auburn University students from the school of Building Science have visited the lake cabin to learn about LEED for Homes and get some hands on lessons in sustainable design and construction practices. The original cabin on site was plagued by leaks, and had significant issues with the wiring, plumbing, and foundation. After spending 4 years working on renovation designs, the owners finally decided to start over. 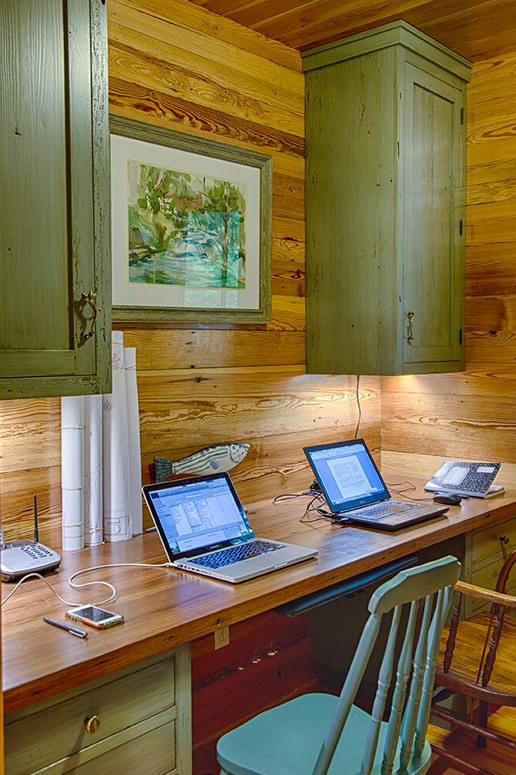 Because of a strong “waste not, want not” mentality and the sentimental attachment to the old cabin, they decided to deconstruct it entirely and re-use the wood in their new home. The final design occupies almost the same footprint as an original 1950‘s cabin, leaving the surrounding woods intact, but is expanded with new basement and loft areas. Every inch of interior space is utilized with closets hidden in the paneled walls. 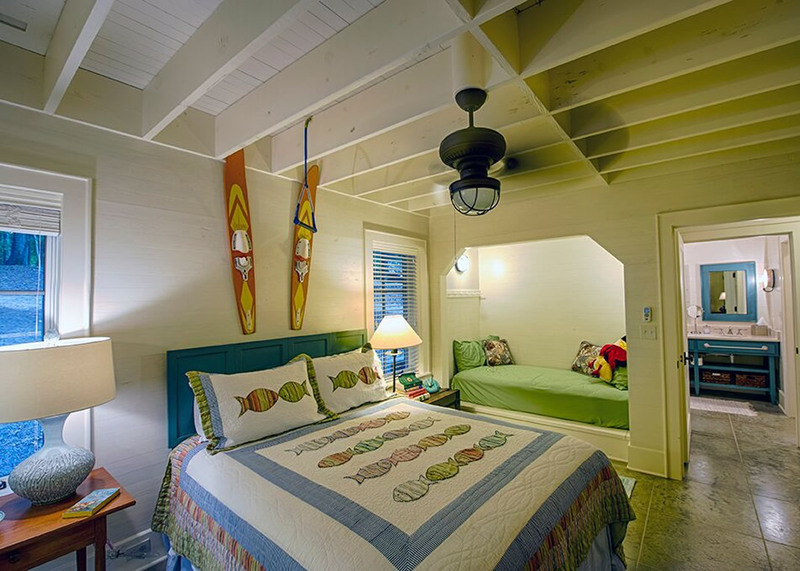 Beds are tucked into window seats, lofts, and even hanging from trusses in the basement. 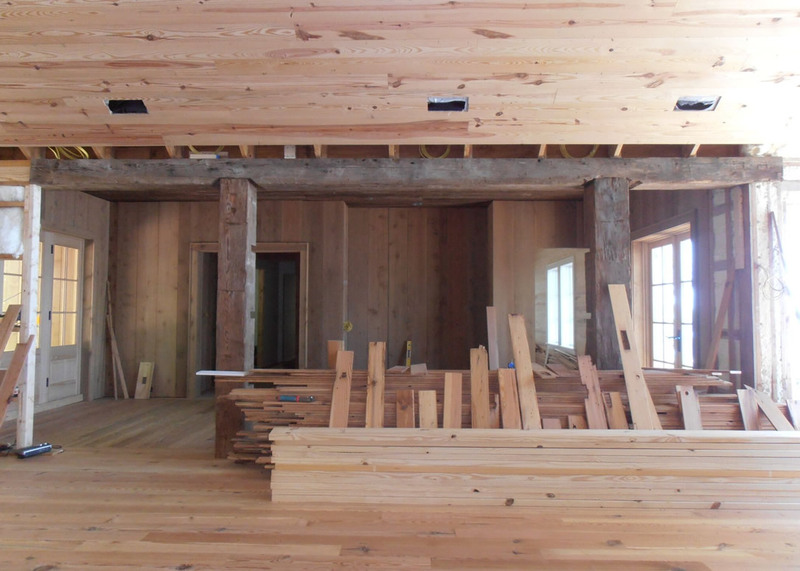 During construction, the contractor alerted the family to a circa 1800‘s cabin nearby that was about to be burned. 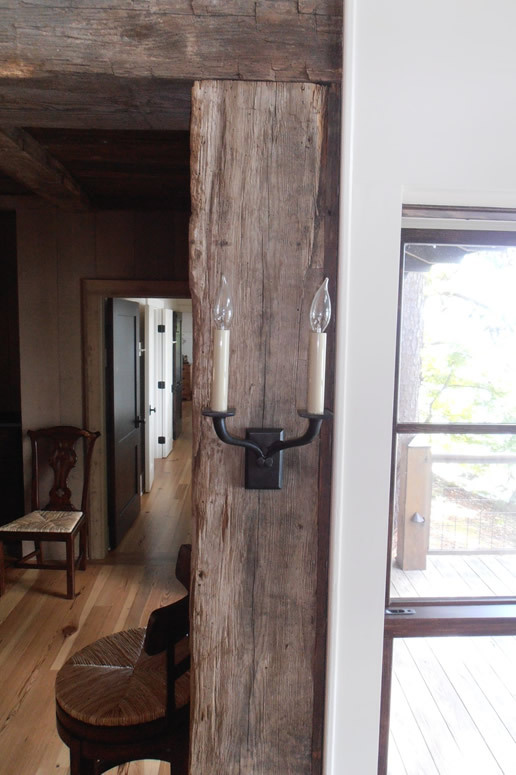 They were able to gain permission to deconstruct that building as well, and salvaged heavy beams, siding, flooring and structure from trees dating back 300 years. 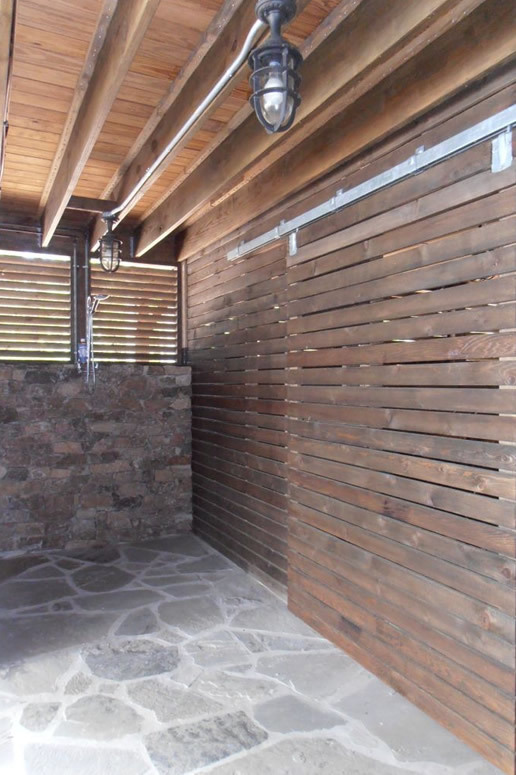 The growing stockpile of wood milled from both structures had a tremendous influence on the design. Drywall was eliminated entirely and walls and ceilings clad in the whitewashed wood from the 1950’s structure. 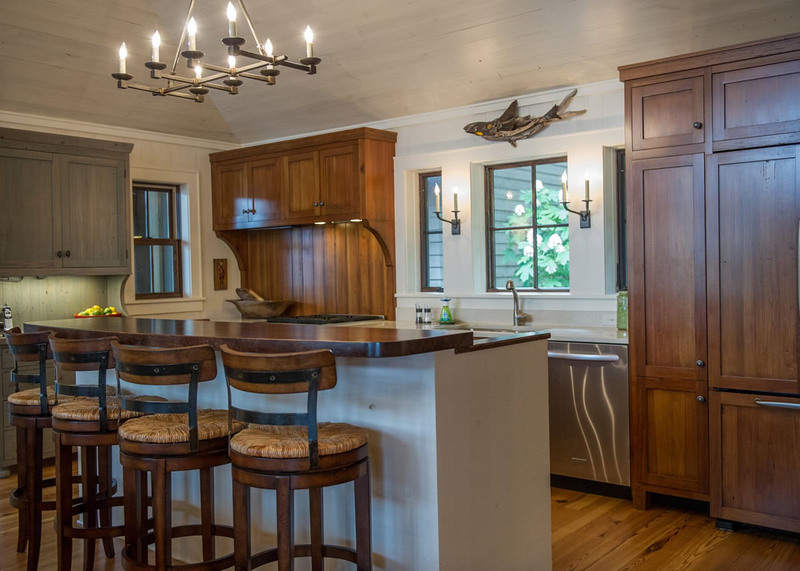 The older wood was milled into flooring and used in its original weathered state in the dining area. The structure of the cabin utilizes advanced framing techniques with a 2’ stud, rafter and joist spacing and insulated framing details. The walls and roof are wrapped in rigid insulation to eliminate thermal bridging and open cell spray foam insulation fills the cavities and overlaps the rafters. The basement is built of insulated concrete formwork. Durability and ease of maintenance were essential concerns in every design move. At all of the entrances, wood slatted bridges and stairs were designed to help knock the sand and red clay off bare feet and boots before entry. 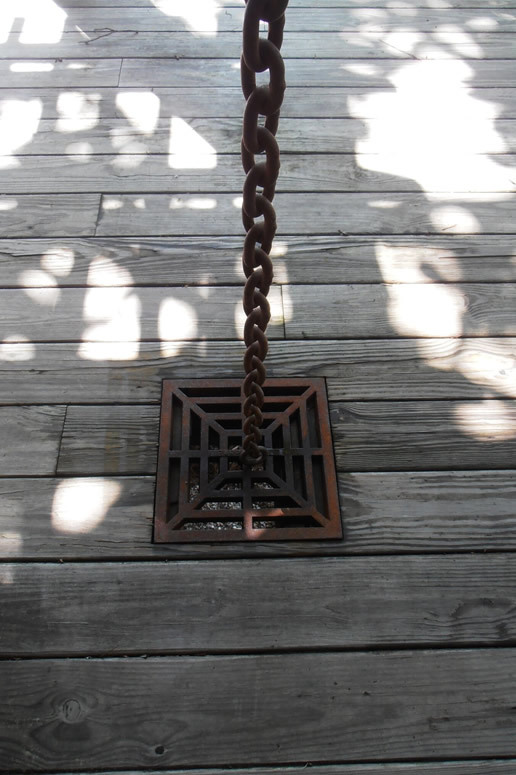 A tree grate forged in a foundry designed by the owner’s business was utilized as a secondary boot scraper and welcome mat at the primary entrance. It was important to the family that the house have a strong connection to the site and an easy flow from inside to out. 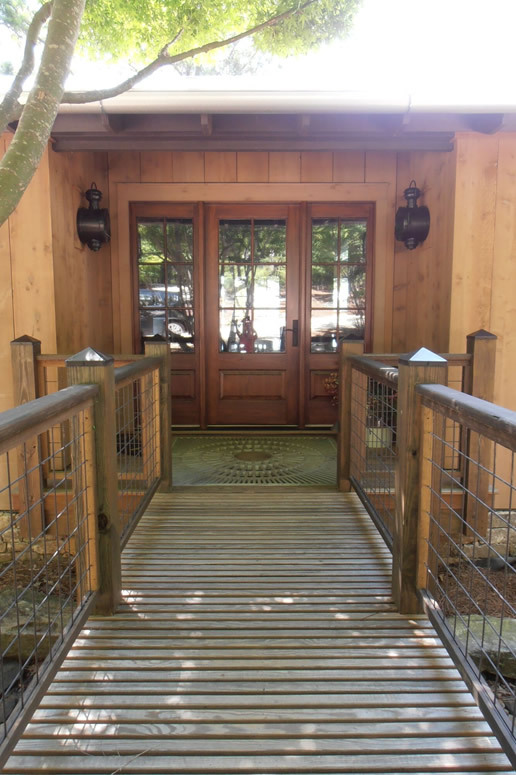 A large screened porch and a variety of shaded outdoor spaces meet those needs. 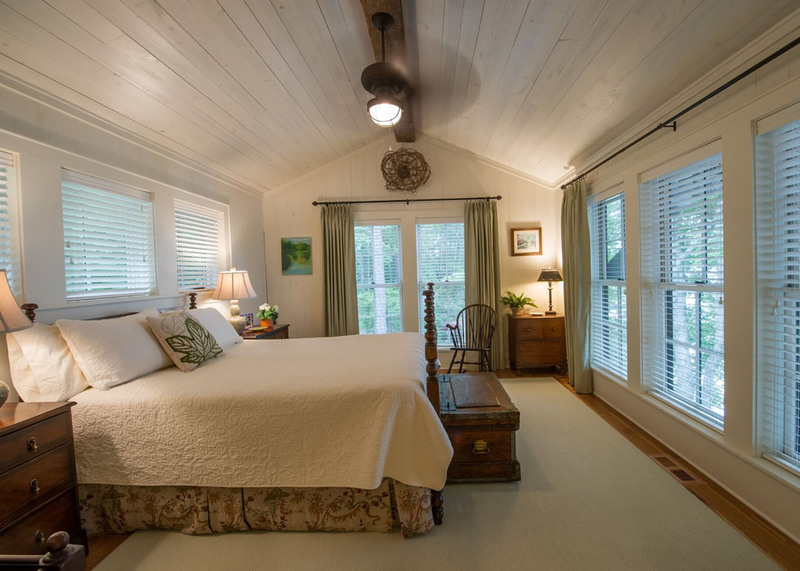 Windows wrap the corners of the main living spaces and bedrooms, inspired by the vernacular design of the 1930‘s worker housing at Lake Martin Dam. 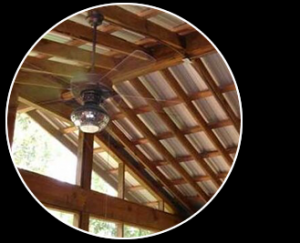 Rainwater is managed so that it engages the senses in summer storms, with rain chains visible from the interior channelling water through a dry creek bed to infiltration zones and a metal roof magnifying the sound of each drop. There is a tree in the yard that the family calls the “curvy tree.” It is an old longleaf pine that grew out from under a rock and twisted around a few times trying to reach for the sun before getting the chance to grow upright. It’s been a bench, a jungle gym for all the kids and a backdrop for years of family pictures. 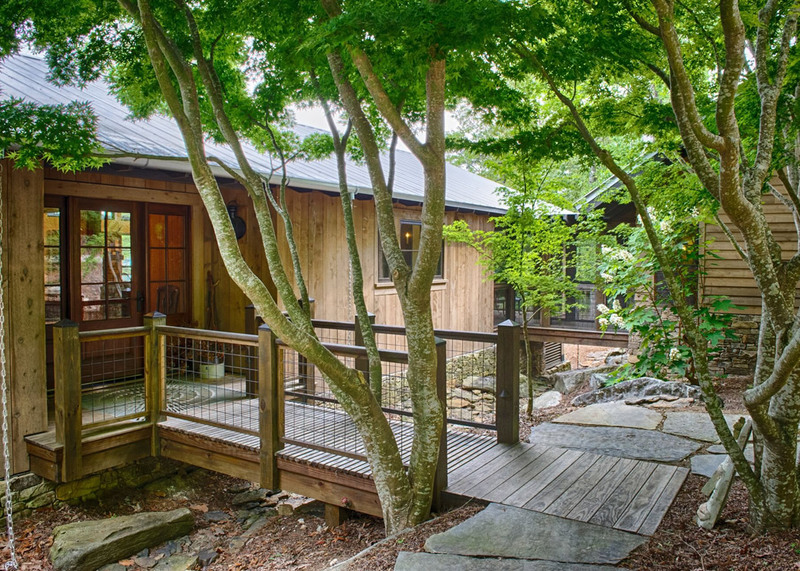 The main entry of the cabin is on axis with the curvy tree, it’s reflected in a mirror in the front hall, and framed by a window in the game room. The contractor was instructed to guard it from soil compaction and accidental damage during construction with his life. During the construction of the cabin, terrible tornadoes tore through the lake, narrowly missing the cabin. 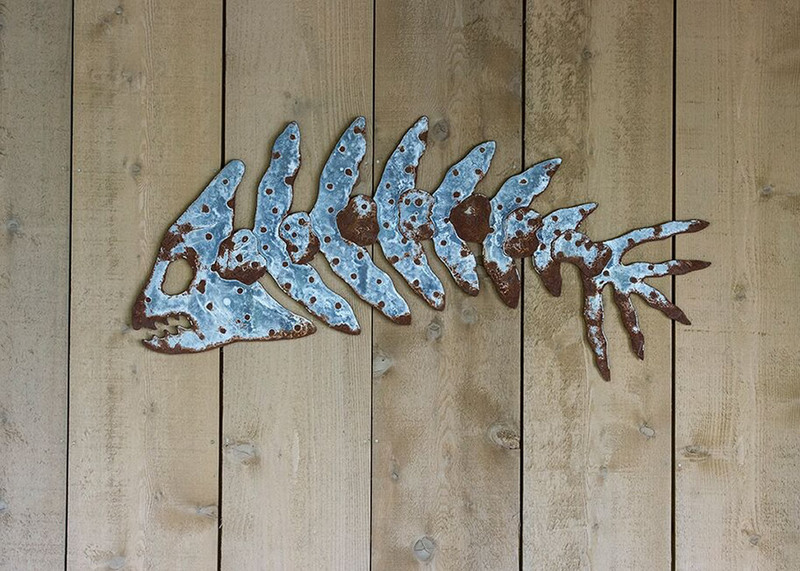 The architect and owners came to see the curvy tree as a symbol of southern resourcefulness and how being shaped by the environment, sometimes even gaining a few scars, can create a thing of beauty.